Well, from my perspective had you not replied, it probably wouldn't have been discussed further. That's what I thought the 4th time he posted it. Whatever - I wasn't even the one questioning whether anything put out there about Newsome could be believed. If he runs in the mid 4.4 range, benches 225 25+ times and runs the short shuttle time he should, Peppers will go in the top-half of the first round. A decent LB coach can teach him how to shed better, and a decent secondary coach should be able to mold him into a very good SS. There were a lot of people saying Ian Gold didn't have a true position in the NFL when he was drafted in the top third of the 2nd round and his measurables are not near as good as Peppers' should be. Say what you will about being a workout warrior, but teams draft more on measurables now than ever. It appears I overestimated Peppers' strength--he only had 19 reps of 225 in him at the combine. He competed at 213 lbs. He turned in a 4.47 and then a 4.46, and had a 10'8" SBJ--both were best amongst all LB tested. These are also elite Safety benchmarks. His 35.5" vertical jump was respectable, not freakish like Eric Berry's 43" years back but good. There are some who feel this performance could put him back into the top 10. This is optimistic, but a lot of influential people liked what they saw out of Peppers in the combine. I can honestly see him doing well at any of those positions, but he's going to have to be able to focus on one. He strikes me as a player who will either just be awesome right away due to his athleticism, or will start out bad but then become good when he learns his position. I have a hard time thinking someone with his natural ability + work ethic won't become good eventually as long as he can focus on one position. I wonder if he has the ball catching skill to play receiver. I would have thought they would have already used him there more at MI if he had - a la Woodson. I'm guessing he is slated for safety, which seems like at least a bit of a waste for an athlete that is supposed to be unique, but in the NFL they could probably run over him at LB and the fact that they stopped using him at corner at UM just makes me wonder. You can talk all you want about 'putting him where he had the most impact' but they've been doing X's and O's in FB a long time and an out of this world corner just doesn't strike me as something you spend a lot of time trying to put somewhere else. Then again, maybe Harbaugh is just nuts. But I agree it's a story that you can't help but be interested to watch. I could be wrong about this, but I have a feeling that Peppers would have been just fine playing receiver. He displayed very good hands as a return man, IMO, showing none of the growing pains young returners do at times handling the ball (think Gallon, or even better, try not to--yikes!). It just seems that Peppers' skill set wasn't going to stand out at WR alongside Chesson and Darboh like they did in the Michigan backfield as a change-of-pace to both Speight and Smith. As a LB, it is a real possibility that Peppers is just too light in the *** to play there in the NFL. Teams had some success running right at him this year. It was when they ran away from him and allowed him to run downhill and catch the play. As a CB, Peppers lacks vertical leap and, very possibly, cover skills for a starting NFL CB. I don't think this is a fit for him. As a SS, it seems this is the best fit for him. He's athletic like a FS, but it is unknown how he would do in centerfield. As an in-box safety, we know he can be a big asset in a blitz package or running down a ball carrier, and he's physical enough to cover most TE. You touched on something important, G2, in that you don't really mess around with moving a pure CB. I think Harbaugh saw that he had some guys that could develop into very good B1G corners--perhaps better than Peppers at the spot. What he didn't have was a playmaker at LB, and Peppers sure gave him that. I think he does just as well at either safety spot in college, but we had a pair of good ones already. The Pope has a new hat. Is it lined with gold leaf? I can't believe how old Harbaugh looks there. I wonder if that's the Pope's official photographer there. If it is, kida disappointing he doesn't have a flagship body with a more bad*** lens. #enjoythego ???? It just feels a little constipated to me. 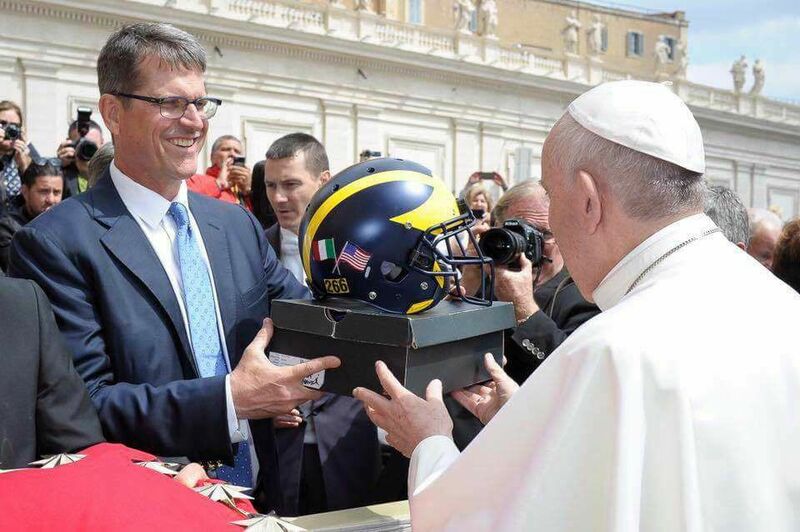 What's in the shoe box under the helmet? 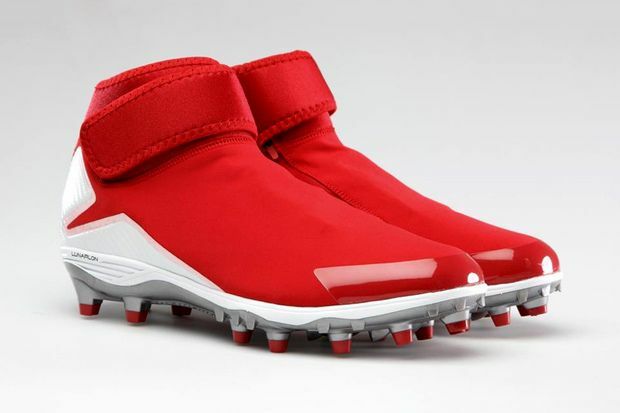 A pair of cleats? I wonder what an endorsement deal for The Papacy looks like for Nike? Some practice notes from Rome. 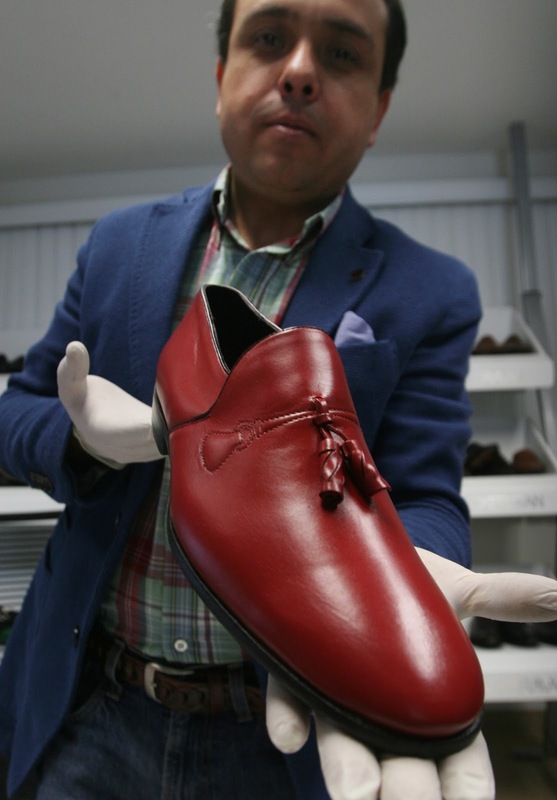 We need to include the ridiculous red shoes Brendan Jennings had. I went back to see if I could find the original GDT on this, but I think it pre-dated the split of the UM/MSU Threads. I decided to put it here. I stumbled on the 2008 Capitol One Bowl between UM & Florida yesterday on BTN. Lloyd Carr's last game .. against Urban Meyer & Tim Tebow. As soon as I turned it on, the first thing I hear is "Tebow throws complete to Aaron Hernandez, a backup tight end." A little surreal to hear that .. & to see Rich Rodriguez getting ready to take over. I shuddered. Being at that game, it was a surreal experience all the way around. --Adrian Arrington has the game we all wanted him to have for three years. --Mike Hart fumbles at/near the goal line--twice!! --Lloyd Carr opens up the offense as if he was really a spread coach coming out of the closet after all these years. --Cam Newton playing next to Tebow in the backfield in the RZ, sometimes with Aaron Hernandez in motion. --Ryan Mallet in a Michigan uniform. --Anthony Bass walking gingerly on the sidelines, occasionally near Rich Rod. What a pair they would have been, of course . . .
--Sitting in the FL section, Gator fans giving us the business until Michigan started rolling. There was nothing normal about that bowl game. Following up on the grant newsome discussion last page, I'm sure everybody saw the news a few weeks ago, but he revealed that the doctors told him he was about 30 minutes from losing his leg. Something about a 1 in a million type of injury. They had to remove calf muscle as part of it. I think the knee disclocated a second time after it had popped back in and that was what complicates everything. But the report is that the knee is structurally sound now. He still has a lot of rehab, but playing in 2018 is a real possibility. Anyway, he had like 6 different surgeries and was in the ICI for about 10 days at least initially. I guess that's how you end up in the hospital for 40 days. Dumb question maybe, pretty sure of the answer. But the school covers all of his medical expenses right? Or their insurance does most likely. Interesting question. I looked it up. The ncaa has something called the catastrophic injury program, which provides medical benefits after costs have exceeded 90k. The 90k is covered by the student's personal or family insurance, or through insurance provided by the school. In order to be eligible to play, the school has to provide proof that the athlete is covered. So, if the kid is covered by his family's insurance, the school would forward their policy to the NCAA. If the kid is not sufficiently covered, the school has to get insurance for them. But along with that can be various deductibles and copays and out of network expenses. There is a lot of flexibility in what schools can do or not do, so not every situation is the same. It really is a monumental game, it's one I remember clearly - a lot of buddies went, but I did not. I know the time is getting close when I gotta shell out cash, but I'll be there for MSU (hopefully at night) and OSU (obviously at Noon). I am genuinely happy we have found some common ground.